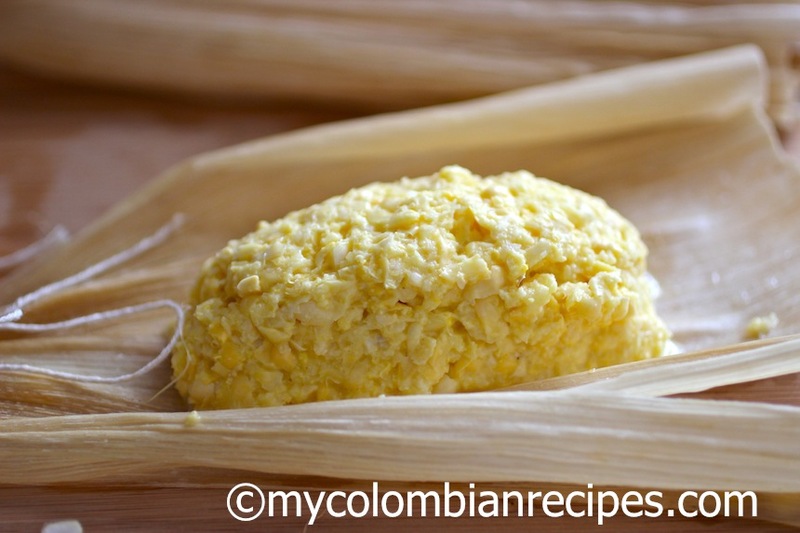 Bollos de Mazorca is a traditional and simple Colombian dish that uses fresh corn, which is a perfect dish during the corn harvesting season. This simple and tasty dish consists of corn rolls wrapped with corn husks and then steamed, usually served warm with butter and cheese. 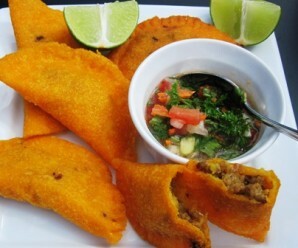 Bollos de Mazorca (Boiled Fresh Corn Rolls) are one of the most popular street foods on the Atlantic coast of Colombia. 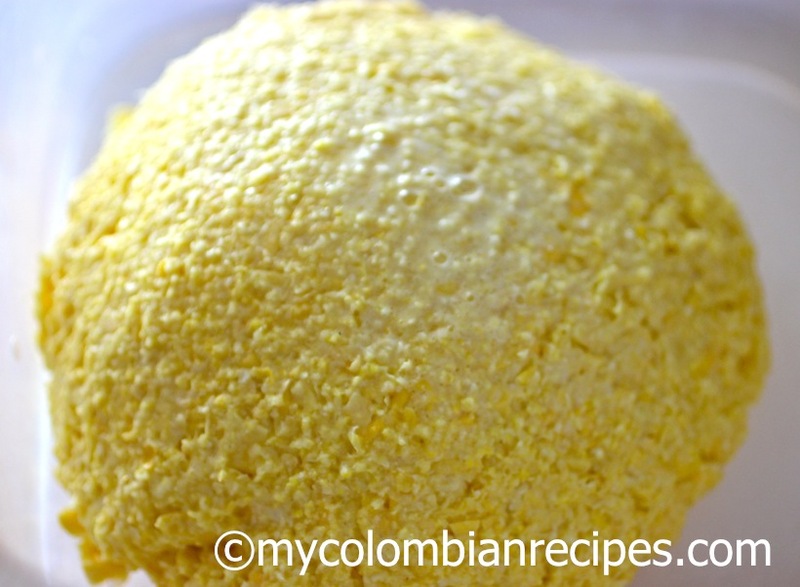 There are many variations of Bollos or Envueltos in Colombian cuisine. 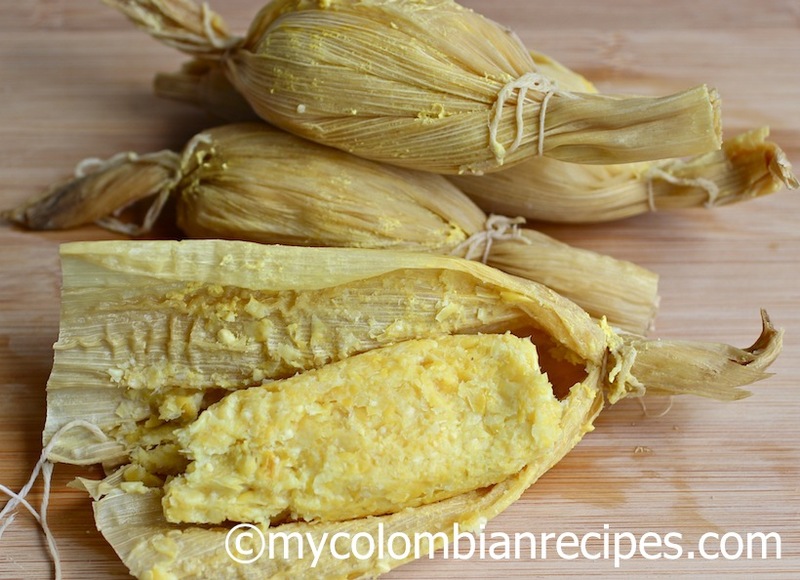 Some traditional versions are, Bollo de Yuca (Cassava Rolls), Bollo Limpio (Corn Hominy Rolls), Envueltos de Choclo (Fresh Corn Rolls with Cheese), and this Bollos de Mazorca recipe. The first time I made this dish here in the United States the rolls were very watery. I believe the problem was that the corn in Colombia is different from the corn I find here in the United States. 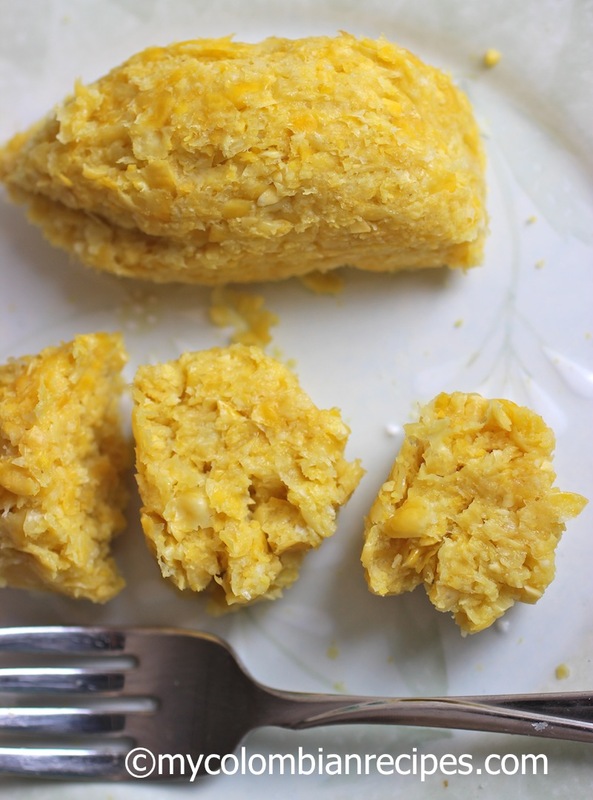 So this time, I added corn meal to create a thicker consistency, but traditionally, Colombian Bollos de Mazorca are made with only fresh corn, sugar and salt. 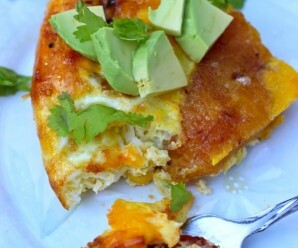 This recipe is simple to make and can be served as a snack, breakfast, appetizer or as light lunch. 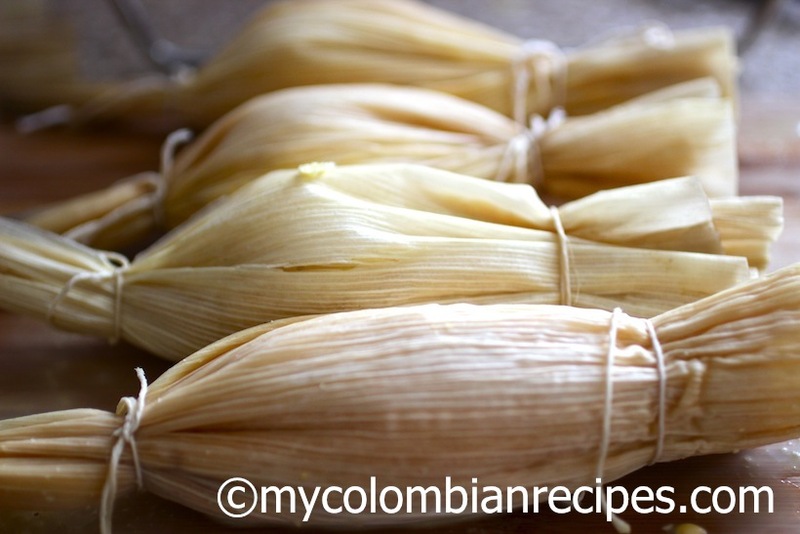 Remove the husks from the corn and keep each large husk for wrapping the bollos. Place the husks in a large bowl and cover them with hot water. Soak the husks until they are soft. 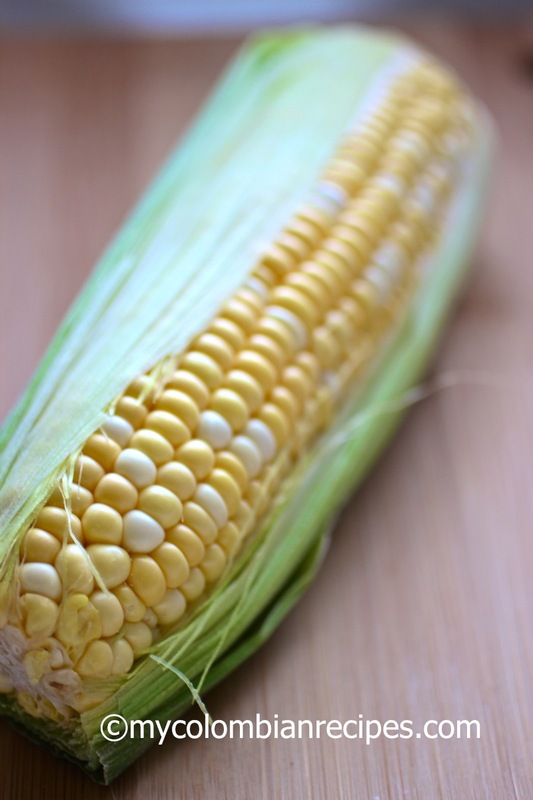 Remove the corn kernels from the cob with a knife. Place the fresh corn, corn meal, sugar and salt in the food processor and process until the corn is pureed. 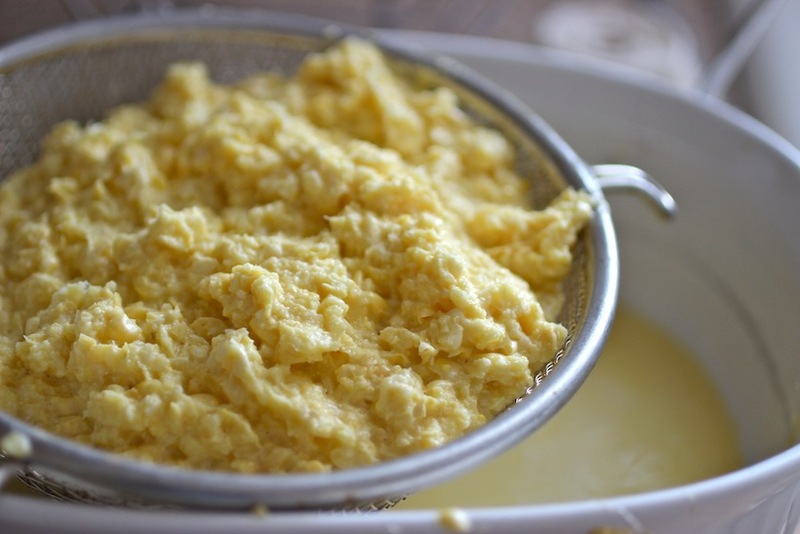 Strain the corn mixture through a sieve and discard the liquid. In large deep pot place about 2 cups of water and a steamer. Bring the water to a boil. Remove the corn husks from the water and dry. 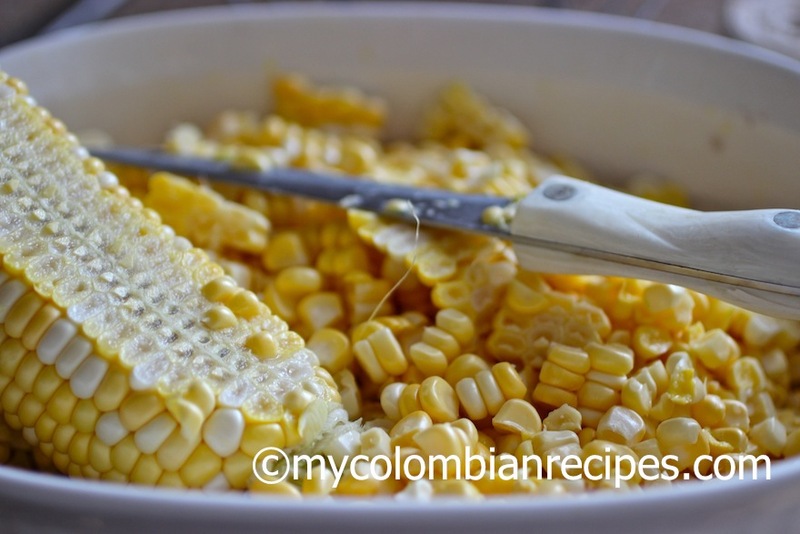 Lay the husks on a working surface and spread about 6 tablespoons of the corn mixture in the center of the husk. Roll the husk and tie the ends with kitchen twine creating a roll. Repeat until all the filling is used. Add the bollos to the steamer, cover and cook, approximately 30 to 40 minutes. Thank you soooo much Erica!!! 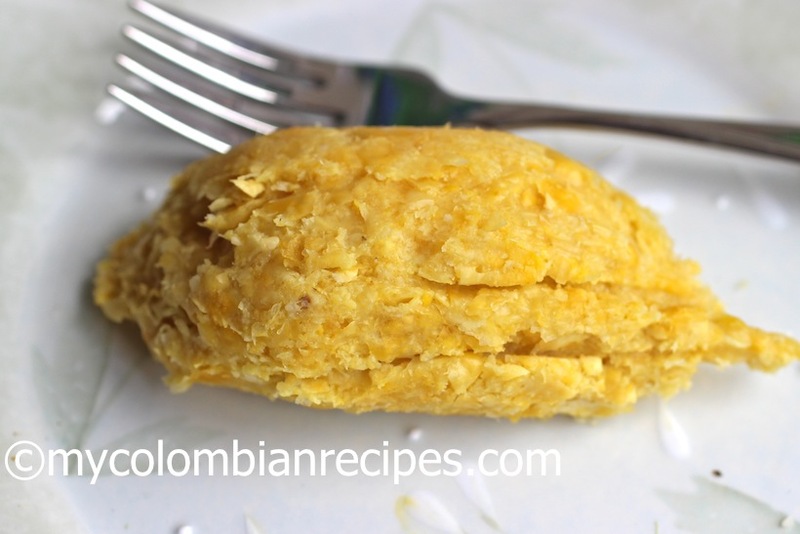 Muchisimas gracias por publicar esta receta de la Costa Colombiana. Lo prometiste y lo cumpliste! Estare haciendo esta receta bien pronto y te dejare saber. 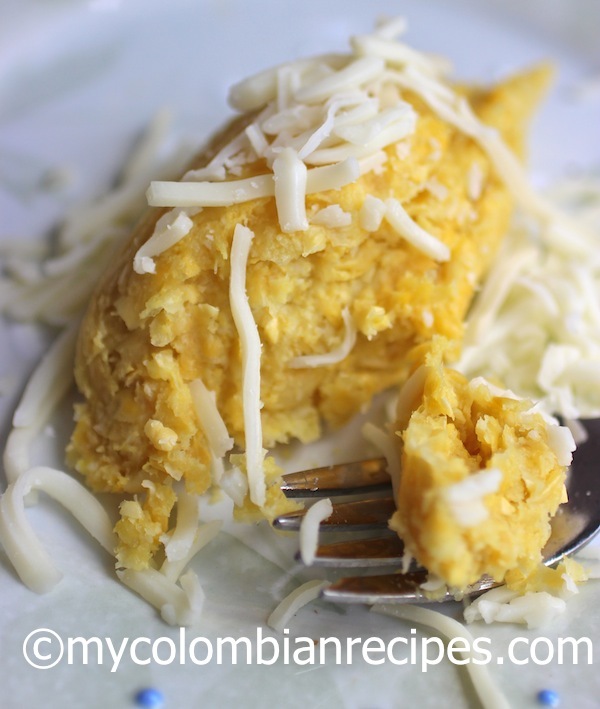 Siendo de Cartagena, con este receta y los deditos de queso, viva Colombia!!! y de nuevo mil gracias a ti! What great little packages. This is definitely the season for fresh sweet corn. 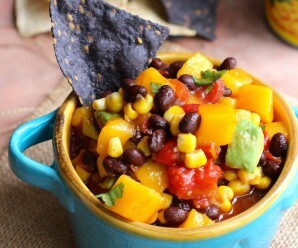 I have never had corn prepared this way…they look great! Thanks you Erica!! This brings me back memories of growing up in B/quilla. the women on the streets,selling bollos and carrying them in a big basket on their head,my favorites were bollos de mazorca y de angelito! I have never seen bollos the mazorca in the colombian restaurants or bakery in NYC, I figured its must be because most of them are calenos. 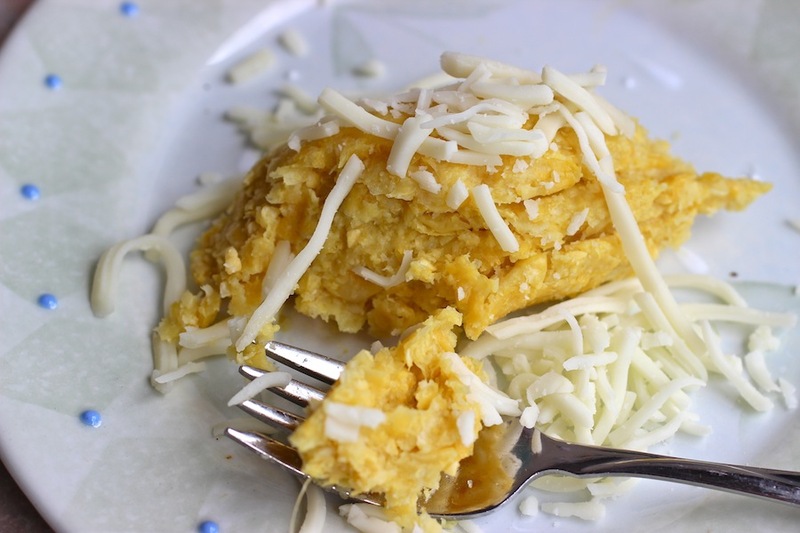 Arepas de choclo and choclo con queso is the closest to bollo de mazorca that I eat and buy at the supermarket.Thanks for the recipe, now i’ll make my own bollos. Erica can you find out how to make bollos the angelitos? all I remember is that they were delicious and kind of purple. Hello, I am visiting family again en B/quilla and eating bollos de angelito whenever I can. I really want to make them back at home. I can not find if you posted this recipe? I will make them soon! I’m from Barranquilla and would love you to post the recipe for Bollos de Angelito 🙂 Sooo yum !!! Very interesting. I would like to try them but don’t have a steamer. I wonder if these can be cooked in the oven if they are covered with aluminium foil at the end of the process? I don’t know if you get the same texture cooking them in the oven. Erica these a superb. I am a corn lover. 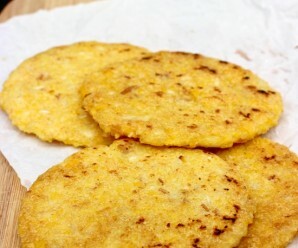 Cachapas de Venezuela, las de Colombia and this one I can see it at breakfast with a “cafe con leche:. this is so interesting to me, and i know i’d love it because corn is one of my top ten favorite pieces of produce. thanks, erica! Hola..Buenas tardes Erica. Your recipes are interesting. I am from India and enjoying my living in Bogota. My family is presently in NY, EEUU. I cook myself at home, being a vegetarian. 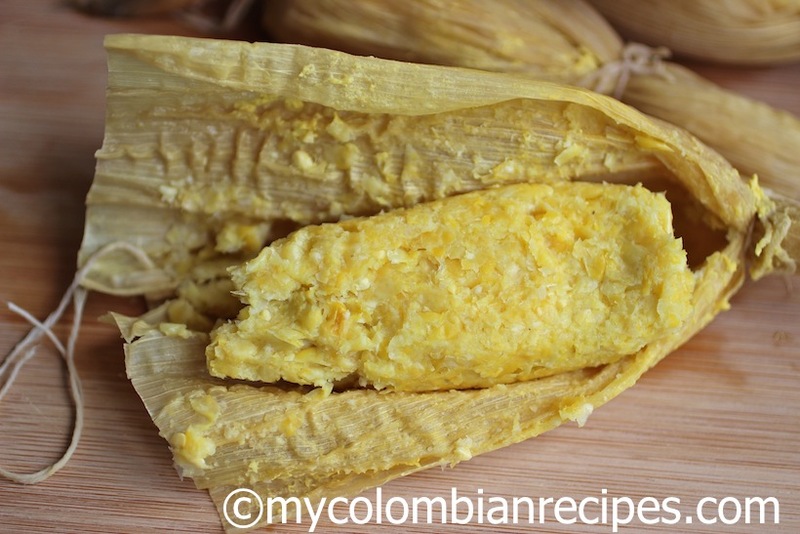 Please post more vegetarian recipes of Bogota. Would definitely try all. Have a good day. Se parece muito com a nossa pamonha mineira,batemos o milho ,acrescentamos apenas um pouco de óleo de soja e acúcar,pondo em duas palhas abertas um pedaço de queijo fresco no meio se fecha e amarra com a própria palha e cozinha.È sensacional! Hi. 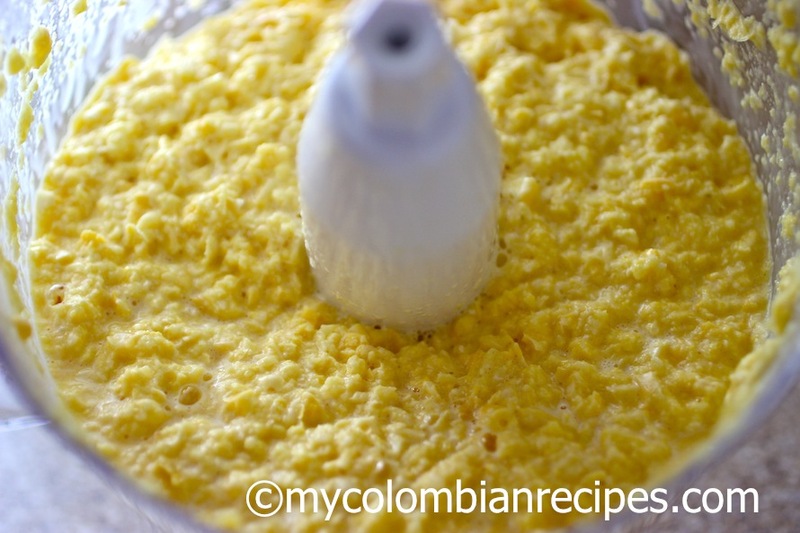 My mother in law is from Barranquilla too – here in the states she uses Masarepa for her corn meal but I don’t understand enough when she tells me how to mix and steam. Are you able to explain to me? My hubby is useless for this.